This past year we cooked a lot of “ancient grains” in our kitchen, prompted by a birthday gift of 5 pounds of quinoa. Yes, Virginia, I am the kind of girl who finds 5 pounds of quinoa a spectacular birthday gift. Along with quinoa we consumed a fair amount of farro. Not a week passes without grits and our bread is enriched with wheat berries. Now here is a word about incorporating “ancient grains” into your diet. Before you get all freaked out about what to do with them, just think of quinoa, farro, barley, oat berries as a substitute for rice. Want to be more adventurous? 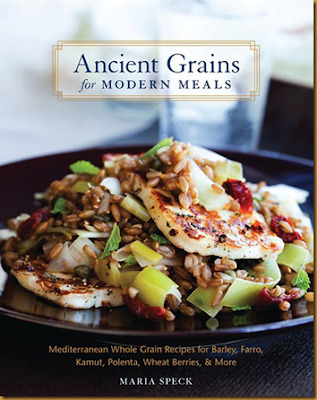 Pick up a copy of Maria Speck’s Ancient Grains for Modern Meals. Maria Speck takes and old world approach to cooking, stating that she doesn’t own a lot of cooking equipment. She has a mortar and pestle rather than a food processor. She does, however, have two different grain mills, as one might expect. Many of these recipes walk you through making the grains first. Once the grains are cooked then the remaining ingredients are prepared and the dish is put together. This year, for Christmas(it actually arrived before Christmas, but that's another story...)we got a grain grinder. It is not the spiffy German one that Speck owns, but a silver behemoth whose bucket was cracked. Upon our first use, we covered the kitchen in a fog of blue cornmeal. We then turned our blue cornmeal into a green cornbread. A good first effort! Health professional tell us we need more whole grain. So if you think that might just be a bowl of oatmeal every now and then you desperately need Ancient Grains for Modern Meals. One of the easiest grains to both find and cook is probably couscous. Like all packaged foods, buy the plain, whole-wheat couscous and not a box that has already been flavored. Remember, your job is to add the flavor. This citrus couscous makes a lovely side dish, especially for roasted chicken. 1. Finely grate the zest of one orange and squeeze the oranges until you have about 3/4 cup juice. Finely grate the zest of the lemon, and squeeze the lemon half to get 2 tablespoons juice. (Reserve the remaining lemon for another use.) Whisk together the orange juice, lemon juice and zest in a liquid measuring cup or small bowl. 2. Bring the chicken broth, olive oil, salt and pepper to a boil in a 2-quart saucepan. Remove the pan from the heat. Stir in the juice mixture and the couscous. Cover and let sit until the liquid is absorbed, about 10 minutes. 3. Taste and adjust for salt and pepper. Fluff the grains with two forks, sprinkle with the parsley, and serve right away. See, that was easy. Now that you have jumped right in you, too, will be getting large bags of quinoa for your birthday. Lets hope they throw in a copy of Ancient Grains for Modern Meals. Happy Birthday.